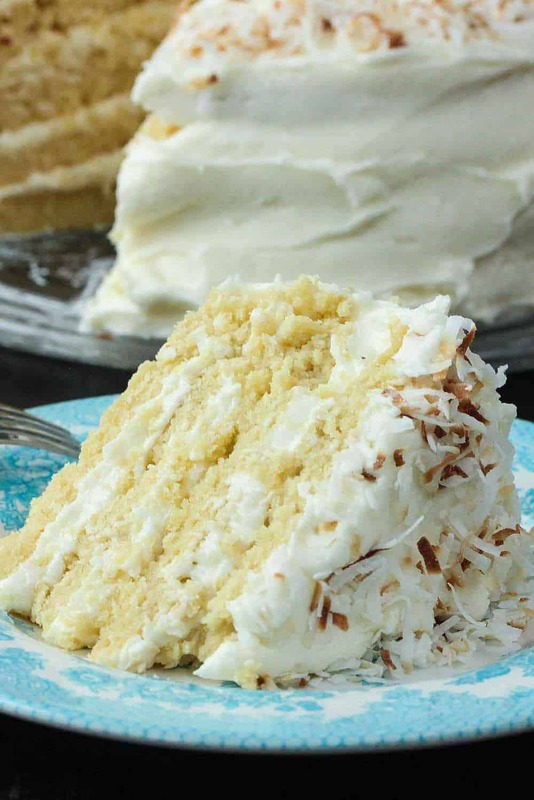 This Coconut Cream Cake recipe is divine. Moist and so flavorful. I just love a cake with multiple layers, but you could easily do this in 2 pans (instead of 4), or even in a cake sheet. The oven temp may seem low, but don’t worry, it helps produce a cake that is moist and super delicious. If you go with 2 pans (instead of 4), increase the cook time to 45 minutes (or until an inserted toothpick comes out clean). Toast the coconut (for the topping) to bring out even more of the amazing coconut flavor. This is a cake to make when you want to impress. So good! 125% Loon Approved. Be sure your 8-inch cake pans are straight-edge for best results. These are the cake pans I use, and I absolutely love them. Now, let’s make this Coconut Cream Cake recipe! 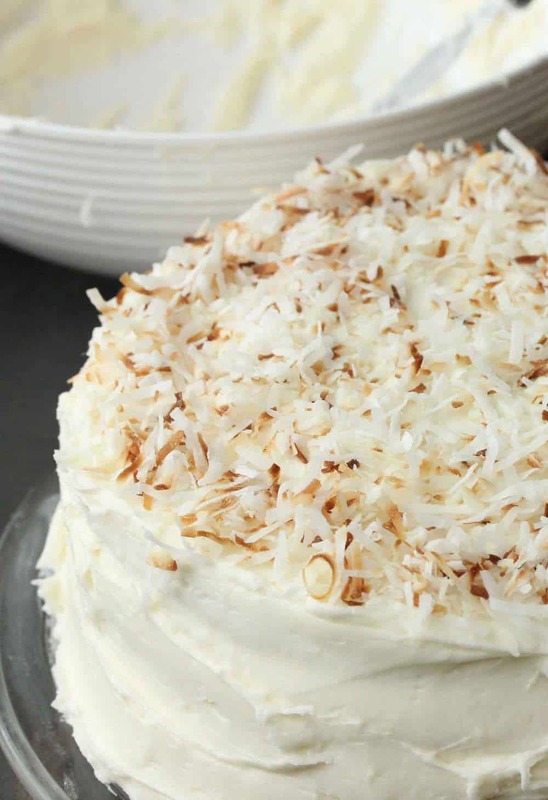 This Coconut Cream Cake is gorgeous and super delicious. Perfect when planning a special meal. So moist and so flavorful. Delicious. Pre-heat oven to 275 F and grease 4 8-inch straight-edge cake pans. In large bowl, combine the flour, 1 1/4 cups sugar, salt, baking soda, and baking powder. Set aside. In bowl of stand mixer fitted with whisk attachment, whisk together buttermilk, yolks, oil, and vanilla. In large bowl, whisk egg whites, slowly incorporating remaining 1/4 cup granulated sugar until egg whites peak. Fold peaked whites into batter and mix on low until mixture comes together. Bake for 25 - 30 minutes, or until toothpick comes out clean when inserted. Once cooled, wrap in plastic and refrigerate until ready to frost. While cake is cooking, make the frosting by beating butter in large bowl until smooth. Add cream of coconut and coconut flakes to mixture and beat for 3 minutes or until fluffy. Invert cakes from the pans. Place one cake on serving dish. Use cake leveler to create even layers (optional). Frost top layer, and then repeat with remaining cakes. Frost sides of cake and top with toasted coconut. Do you have an elevation alteration for the recipe? I live at 6500 ft above sea level. Great question, Leslie! I’m going to do a little research on that question. I don’t want to give you an answer that might lead to less than desirable results. Be back in touch. Thank you! I like moist cakes – what can I wet the cakes with that would pair well with the coconut flavor? The meringue folded into the batter keeps it nice and moist. The butter and buttermilk help, too. That works for us! But, did you have anything else in mind? I hope I was understanding your question correctly! :). you did understand my question correctly. I was wondering if I could drizzle the cake layers lightly with a simple flavored syrup … not sure what to put in terms of flavor (rum) in as I wouldn’t want to overpower the other flavors..
oooh, a touch of rum would be nice in the cake batter, or mixed in with the icing. Maybe 1/4 cup? Dark rum would be nice. I’ll think on it some more, too. I hunch there is an error in the temperature the recipe states to preheat the oven? Not 275’F surely? Hi there! Nope! No error. Lots of folks ask that question. When you divide it among the 4 cake pans, it cooks more quickly. If cooking in two pans, increase the cook time to about 45 minutes. Of course, ovens vary from oven to oven, so, as we’re certain you now, the good ole’ clean toothpick test is always best. In some ovens, it may take a little longer. When I make it, it takes close to 30 minutes. This looks like a wonderful cake. But why in the world would you put the picture of a bowl of melted butter on the print copy instead of a picture of the cake? I want a pic of the final result when I print so I can see how it should look. This recipe looks so yummy!! Does it work well as a cupcake recipe as well? Thanks! It is really yummy, Per!! Did you make it yet?